We landed late last night into Cape Town South Africa, and ran into a few luggage challenges, but they all did get sorted out. It is certainly nice flight on KLM from Amsterdam down south which keeps in you in the same time zone! It is nice being in a city when you can use Uber (ride sharing) very reliably and cheaply to get around quickly. Only $15 to or from the airport during non-rush hour time windows. $20 if you want to pay for UberBlack. 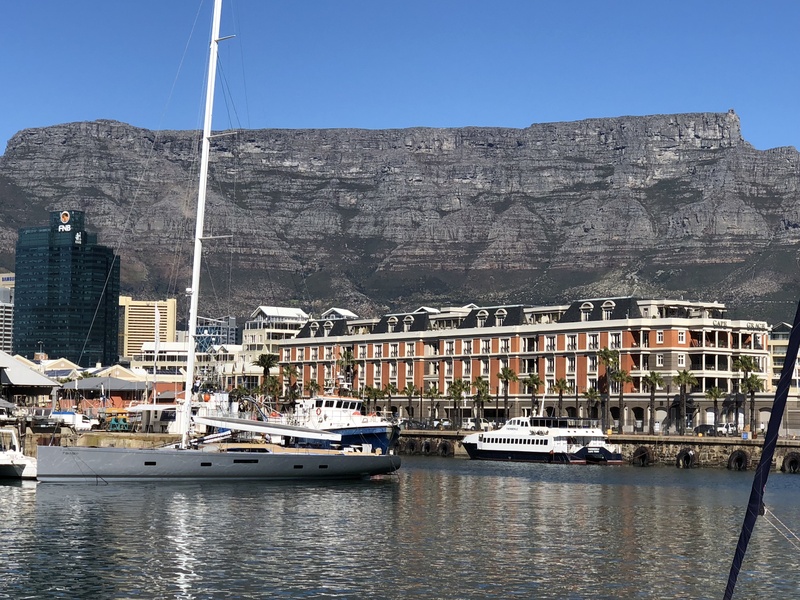 We are staying at the Cape Grace hotel which is backed by the famous Tabletop Mountain on one side and the active community waterfront/marina on the other. A perfect blend of location, luxury, history and great hotel service. The waterfront is full of history, places to eat, museums, statues, music and tours. Stay tuned for more on this topic tomorrow…now on to the more interesting topic for today! 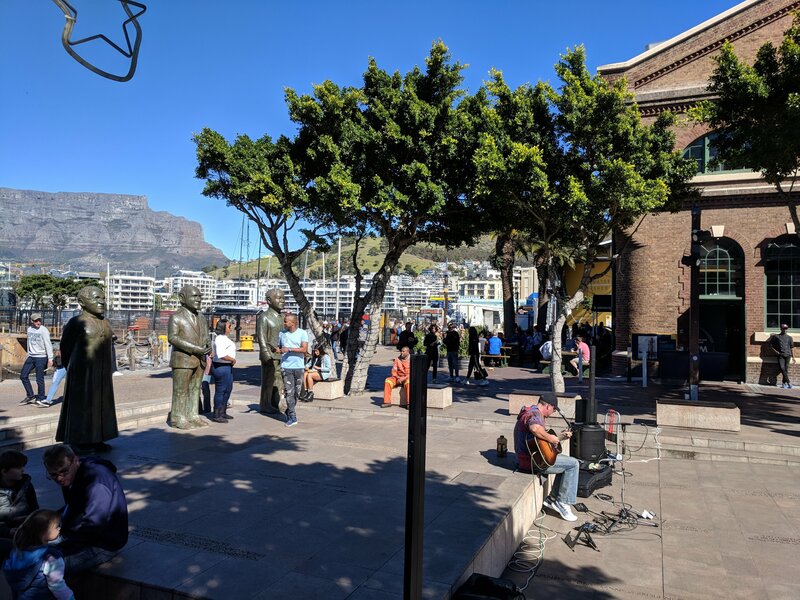 Now the weather in South Africa and Cape Town can be quite variable in the winter months, so when you have good weather, what do you take advantage of? Go hiking early in the morning in the mountains before the sun rises! 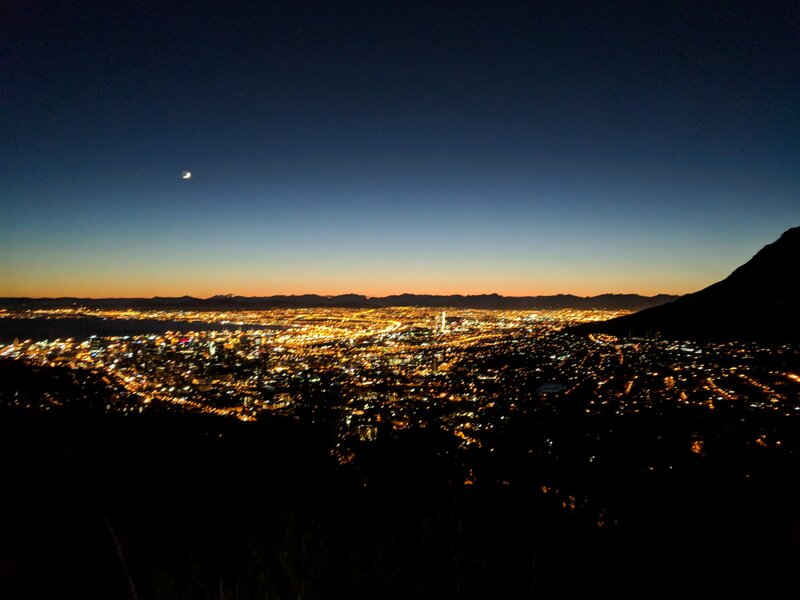 This shot is a nice view of the city when we were about half way up the Lion’s Head peak with the crescent moon still up on the sky. 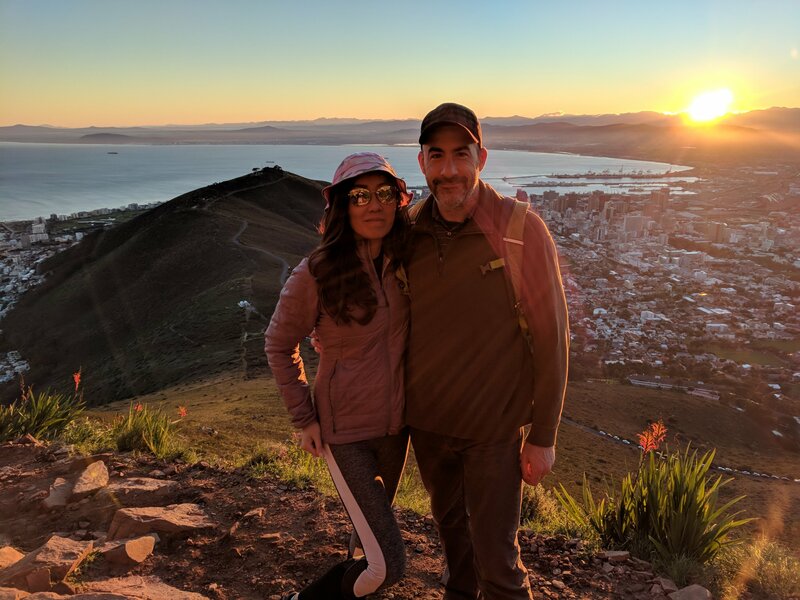 Of course, we saw the sun rise on the other side as we made slow circles up the mountain to accomplish the steep 600+ meter climb towards the summit which is quite tricky in some spots where ladders and chains are necessary. Here is what it looks like from the bottom when we walked back down when the sun was starting to get hot and the holiday crowds swarming the trails. Summary: it is not a novice trail and even though you do not need hiking boots, the rocks and steps can be quite narrow and tricky to navigate. We were told that at least 1 helicopter evacuation/rescue occurs every day on these hiking routes because it is so accessible, but requires careful navigation. Here is a quick video of the sunrise and feel for the quality of the rocky trail on the way up to the top. 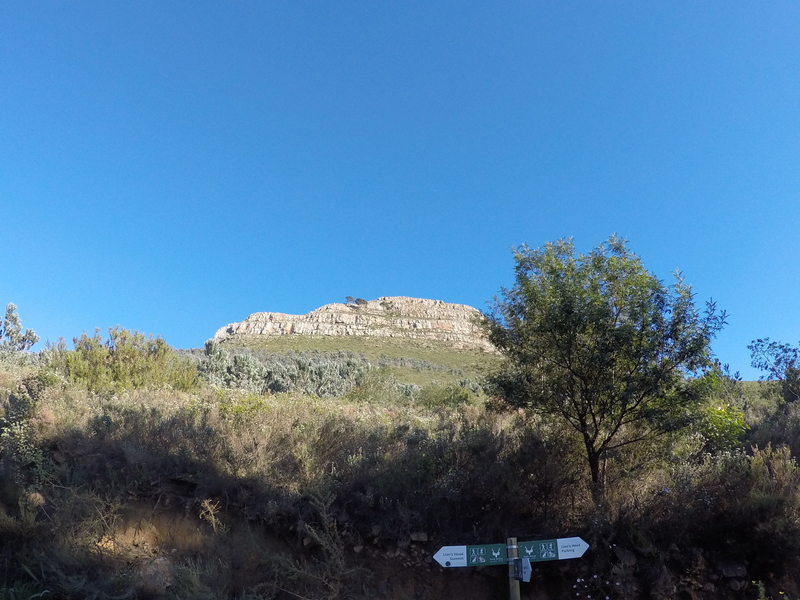 One of the really delightful aspects of hiking in South Africa is the fact that EVERYONE says “hello” and “good morning”. One of the friendliest countries I have ever encountered on my travels when it comes to meeting people in parks, hiking or exploring. and if you would like to get a peek at Brad Pitt’s house down below the 7 Apostle peaks, check out this video. That is a very exclusive and expensive gated area of Cape Town. Overall, Cape Town feels pretty safe, and it is not as problematic as Johannesburg as we have been told, but there is sure a lot of razer wire and electric fences on top of many walls in many parts of the city that resembles the risky areas of Lima, Peru that I have seen a few years ago. This entry was posted in International, Travel, Uncategorized and tagged Cape Town, Hiking, International, South Africa, Travel. Bookmark the permalink.